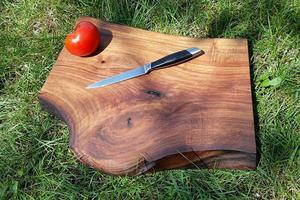 Gorgeous rustic Walnut serving board - cutting board is made from a solid slab of walnut and has two live edge. This walnut slab would be an eye-catching piece on your kitchen counter or serving table. 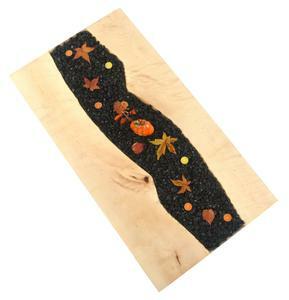 Your board has been hand rubbed with a food safe mixture of organic beeswax and mineral oil. Instructions for care are included with your shipment. NOTE: The item pictured is an example, and yours will be made to order. Your order will be a unique work of art, made to your specifications. Appreciate that the colour and grain will vary from piece to piece. Please allow 1-2 weeks for the creation of this piece. 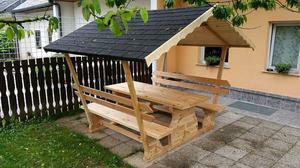 Garden furniture is simply designed and is intended for outdoor socializing. With 2m in length can easily sit up to 8 people. The legs are made from 7cm thick laminated wood, the interior will further connect the two massive sticks thickness of 16mm. ( Show on pictur above ) Legs of garden furniture conjoins the crossbar with the matrix wedge glow bond which her ​​power is greater than screws. The thickness of the table and sprawled is 4,1cm. WOOD: Comes from the Slovenian Julian Alps, which are part of the European Alps European Alps are the highest and most extensive mountain range system that lies entirely in Europe, stretching approximately 1,200 kilometres (750 mi) across eight Alpine countries: Austria, France, Germany, Italy, Liechtenstein, Monaco, SLOVENIA, and Switzerland, This is a high quality wood and we also have a large selection of different types of wood. On the last picture you can see from what places derives the wood. Most of our wood has been air dried for 1-2 years before be finished dried in a kiln. A combination of air drying and kiln drying wood is ideal! Trying to expedite this process makes if much more likely that the wood will bowing, twisting and cracking. FINISHING: Every single one of our live edge and other wood furnishings goes through a labor-intensive, one to two weeks finishing and curing process. We only use all-natural, a mixture of oils and waxes. For finishing we used one of the best products on the market today. German products - Osmo, which are present almost worldwide. They are highly resistant to stains such as human sweat, red wine, cleaners,... It is waterproof, it is not sensitive to pressure, no cracks, peeling or withdrawal. It is easy for maintenance - every 3-5 years only re-applied in a thin layer with a cotton swab, that takes you no more than half an hour. WHEN YOU ORDER: - Every few days we informed you about the progress of work with pictures GOOD TO KNOW: - All of our products are carefully packed in a 1 cm thick plywood surrounded by foams and other accessories for packaging - We shipped with TNT and all shipments have insurance ( you don t need to worry if something accidentally damage ) - transit time of shipments is about 5-15 days ( depending on the delivery address ) - transit time is increased only if the shipment go through customs. This is a process in which no one can influence and it happens once in a while If you want a custom dimension or a different design of legs contact us or request custom order. If you need more than one contact us for discount. Wed love to chat more! NOTE: The item pictured is an example, and yours will be made to order. Your order will be a unique work of art, made to your specifications. Appreciate that the colour and grain will vary from piece to piece. Please allow us 3-4 weeks for the creation of this piece. 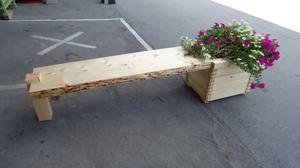 This live edge bench with planter would be great for your garden, backyard, in front of your building, pool,... Simple design with live edge made this bench so uniq. We make them only on orders. 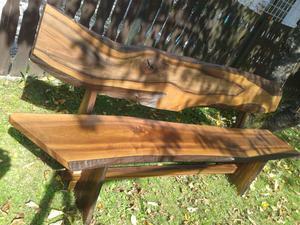 The thickness of the bench is approximately 4cm. WOOD: Comes from the Slovenian Julian Alps, which are part of the European Alps European Alps are the highest and most extensive mountain range system that lies entirely in Europe, stretching approximately 1,200 kilometres (750 mi) across eight Alpine countries: Austria, France, Germany, Italy, Liechtenstein, Monaco, SLOVENIA, and Switzerland, This is a high quality wood and we also have a large selection of different types of wood. On the last picture you can see from what places derives the wood. Most of our wood has been air dried for 1-2 years before be finished dried in a kiln. A combination of air drying and kiln drying wood is ideal! Trying to expedite this process makes if much more likely that the wood will bowing, twisting and cracking. FINISHING: Every single one of our live edge and other wood furnishings goes through a labor-intensive, one to two weeks finishing and curing process. We only use all-natural, a mixture of oils and waxes. For finishing we used one of the best products on the market today. German products - Osmo, which are present almost worldwide. They are highly resistant to stains such as human sweat, red wine, cleaners,... It is waterproof, it is not sensitive to pressure, no cracks, peeling or withdrawal. It is easy for maintenance - every 3-5 years only re-applied in a thin layer with a cotton swab, that takes you no more than half an hour. Each bench is unique! If you want a custom dimension or a different design of legs contact us or request custom order. If you need more than one contact us for discount. Wed love to chat more! NOTE: The item pictured is an example, and yours will be made to order. Your order will be a unique work of art, made to your specifications. Appreciate that the colour and grain will vary from piece to piece. Please allow us 3-4 weeks for the creation of this piece. 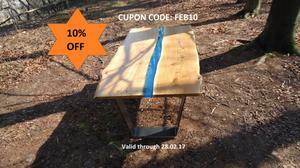 This table is made from 4 pieces of wood glued together. In the wood they are placed wood lamellae which provides a very good bond. WOOD: Comes from the Slovenian Julian Alps, which are part of the European Alps European Alps are the highest and most extensive mountain range system that lies entirely in Europe, stretching approximately 1,200 kilometres (750 mi) across eight Alpine countries: Austria, France, Germany, Italy, Liechtenstein, Monaco, SLOVENIA, and Switzerland, This is a high quality wood and we also have a large selection of different types of wood. On the last picture you can see from what places derives the wood. Most of our wood has been air dried for 1-2 years before be finished dried in a kiln. A combination of air drying and kiln drying wood is ideal! Trying to expedite this process makes if much more likely that the wood will bowing, twisting and cracking. FINISHING: Every single one of our live edge and other wood furnishings goes through a labor-intensive, one to two weeks finishing and curing process. We only use all-natural, a mixture of oils and waxes. For finishing we used one of the best products on the market today. German products - Osmo, which are present almost worldwide. They are highly resistant to stains such as human sweat, red wine, cleaners,... It is waterproof, it is not sensitive to pressure, no cracks, peeling or withdrawal. It is easy for maintenance - every 3-5 years only re-applied in a thin layer with a cotton swab, that takes you no more than half an hour. WHEN YOU ORDER: - We sent you pictures of selected wood that will be used for your product - Every few days we informed you about the progress of work with pictures GOOD TO KNOW: - All of our products are carefully packed in a 1 cm thick plywood surrounded by foams and other accessories for packaging - We shipped with TNT and all shipments have insurance ( you don t need to worry if something accidentally damage ) - transit time of shipments is about 5-15 days ( depending on the delivery address ) - transit time is increased only if the shipment go through customs. This is a process in which no one can influence and it happens once in a while Table legs are made of metal and they are powder coated. Each table is unique piece of furniture! If you want a custom dimension or a different design of legs contact us or request custom order. NOTE: The item pictured is an example, and yours will be made to order. Your order will be a unique work of art, made to your specifications. Appreciate that the colour and grain will vary from piece to piece. Please allow us 3-4 weeks for the creation of this piece. 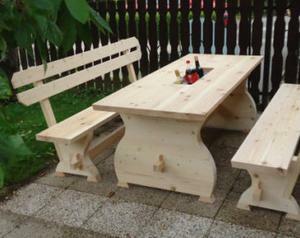 Do you want something natural in your home, garden, backyard, office,... Live edge benches are made from pure Slovenian wood of thickness 4 cm. Every one of our original designs is hand crafted, carefully showcasing the wood’s natural beauty in the live edges, knot holes and the unique grain of each piece Height: 45cm or Custom WOOD: Comes from the Slovenian Julian Alps, which are part of the European Alps European Alps are the highest and most extensive mountain range system that lies entirely in Europe, stretching approximately 1,200 kilometres (750 mi) across eight Alpine countries: Austria, France, Germany, Italy, Liechtenstein, Monaco, SLOVENIA, and Switzerland, This is a high quality wood and we also have a large selection of different types of wood. On the last picture you can see from what places derives the wood. Most of our wood has been air dried for 1-2 years before be finished dried in a kiln. A combination of air drying and kiln drying wood is ideal! Trying to expedite this process makes if much more likely that the wood will bowing, twisting and cracking. FINISHING: Every single one of our live edge and other wood furnishings goes through a labor-intensive, one to two weeks finishing and curing process. We only use all-natural, a mixture of oils and waxes. For finishing we used one of the best products on the market today. German products - Osmo, which are present almost worldwide. They are highly resistant to stains such as human sweat, red wine, cleaners,... It is waterproof, it is not sensitive to pressure, no cracks, peeling or withdrawal. It is easy for maintenance - every 3-5 years only re-applied in a thin layer with a cotton swab, that takes you no more than half an hour. WHEN YOU ORDER: - We sent you pictures of selected wood that will be used for your product - Every few days we informed you about the progress of work with pictures GOOD TO KNOW: - All of our products are carefully packed in a 1 cm thick plywood surrounded by foams and other accessories for packaging - We shipped with TNT and all shipments have insurance ( you don t need to worry if something accidentally damage ) - transit time of shipments is about 5-15 days ( depending on the delivery address ) - transit time is increased only if the shipment go through customs. This is a process in which no one can influence and it happens once in a while Each live edge bench is unique! If you want a custom dimension or a different design of legs contact us or request custom order. If you need more than one contact us for discount. Wed love to chat more! NOTE: The item pictured is an example, and yours will be made to order. Your order will be a unique work of art, made to your specifications. Appreciate that the colour and grain will vary from piece to piece. Please allow us 3-4 weeks for the creation of this piece. If youre looking for something modern with a touch of live edge this is the right answer! This dining table is made from two pieces of carefully selected wood with live edge holding together by resin. Which is simply beautiful! WOOD: Comes from the Slovenian Julian Alps, which are part of the European Alps European Alps are the highest and most extensive mountain range system that lies entirely in Europe, stretching approximately 1,200 kilometres (750 mi) across eight Alpine countries: Austria, France, Germany, Italy, Liechtenstein, Monaco, SLOVENIA, and Switzerland, This is a high quality wood and we also have a large selection of different types of wood. Most of our wood has been air dried for 1-2 years before be finished dried in a kiln. A combination of air drying and kiln drying wood is ideal! Trying to expedite this process makes if much more likely that the wood will bowing, twisting and cracking. RESIN: We use a UV-resistant and crystal clear resin! FINISHING: Every single one of our live edge and other wood furnishings goes through a labor-intensive, one to two weeks finishing and curing process. We only use all-natural, a mixture of oils and waxes. For finishing we used one of the best products on the market today. German products - Osmo, which are present almost worldwide. They are highly resistant to stains such as human sweat, red wine, cleaners,... It is waterproof, it is not sensitive to pressure, no cracks, peeling or withdrawal. It is easy for maintenance - every 3-5 years only re-applied in a thin layer with a cotton swab. WHEN YOU ORDER: - We sent you pictures of selected wood that will be used for your product - Every few days we informed you about the progress of work with pictures GOOD TO KNOW: - All of our products are carefully packed in a 1 cm thick plywood surrounded by foams and other accessories for packaging - We shipped with TNT and all shipments have insurance ( you don t need to worry if something accidentally damage ) - transit time of shipments is about 5-15 days ( depending on the delivery address ) - transit time is increased only if the shipment go through customs. This is a process in which no one can influence and it happens once in a while Dining table height is 76 cm or custom dimension. Thickness of the table top is 3.4cm! Thickness of the leg is 12mm! Contact between the resin and the wood is a very strong! Table legs are made of metal and they are powder coated. Each table is unique! If you want a custom dimension or a different design of legs contact us or request custom order. NOTE: The item pictured is an example, and yours will be made to order. Your order will be a unique work of art, made to your specifications. Appreciate that the colour and grain will vary from piece to piece. Please allow us 4-6 weeks for the creation of this piece. 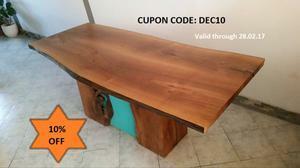 If youre looking for a very massive table with natural edges and with a little retro/rustic - modern style you found it! The thickness of the wood is a 4 cm! 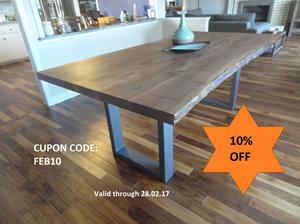 This rustic kitchen table top is made from two pieces of carefully selected wood with live edge. Table leg is made entirely of wood, the wood is selected very carefully. In this case, we are looking for the wood defects in the natural edge. Which is simply beautiful! Kitchen table height is 76 cm or custom dimension. One pictures is a combination of: Walnut wood + mint color ( You can also choose your own color and wood type! ) Each table is unique! If you want a custom dimension or a different design of legs contact us or request custom order. WOOD: Comes from the Slovenian Julian Alps, which are part of the European Alps European Alps are the highest and most extensive mountain range system that lies entirely in Europe, stretching approximately 1,200 kilometres (750 mi) across eight Alpine countries: Austria, France, Germany, Italy, Liechtenstein, Monaco, SLOVENIA, and Switzerland, This is a high quality wood and we also have a large selection of different types of wood. On the last picture you can see from what places derives the wood. Most of our wood has been air dried for 1-2 years before be finished dried in a kiln. A combination of air drying and kiln drying wood is ideal! Trying to expedite this process makes if much more likely that the wood will bowing, twisting and cracking. FINISHING: Every single one of our live edge and other wood furnishings goes through a labor-intensive, one to two weeks finishing and curing process. We only use all-natural, a mixture of oils and waxes. For finishing we used one of the best products on the market today. German products - Osmo, which are present almost worldwide. They are highly resistant to stains such as human sweat, red wine, cleaners,... It is waterproof, it is not sensitive to pressure, no cracks, peeling or withdrawal. It is easy for maintenance - every 3-5 years only re-applied in a thin layer with a cotton swab, that takes you no more than half an hour. WHEN YOU ORDER: - We sent you pictures of selected wood that will be used for your product - Every few days we informed you about the progress of work with pictures GOOD TO KNOW: - All of our products are carefully packed in a 1 cm thick plywood surrounded by foams and other accessories for packaging - We shipped with TNT and all shipments have insurance ( you don t need to worry if something accidentally damage ) - transit time of shipments is about 5-15 days ( depending on the delivery address ) - transit time is increased only if the shipment go through customs. This is a process in which no one can influence and it happens once in a while NOTE: The item pictured is an example, and yours will be made to order. Your order will be a unique work of art, made to your specifications. Appreciate that the colour and grain will vary from piece to piece. Please allow us 4-6 weeks for the creation of this piece. 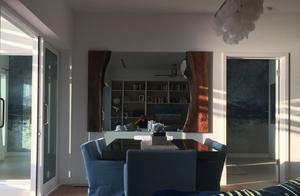 If you have a wall mirror just glued to the wall and if youre looking for something that would be enriched the appearance of mirror you just found it. This decoration for mirror is made from two pieces of carefully selected wood with live edge and will certainly spice up the look of your mirror. It includes a set of material for attaching on to the wall. This wood can turn as you want. If you need a custom dimension contact us. Not suitable for bathrooms! Each wood is unique! WOOD: Comes from the Slovenian Julian Alps, which are part of the European Alps European Alps are the highest and most extensive mountain range system that lies entirely in Europe, stretching approximately 1,200 kilometres (750 mi) across eight Alpine countries: Austria, France, Germany, Italy, Liechtenstein, Monaco, SLOVENIA, and Switzerland, This is a high quality wood and we also have a large selection of different types of wood. On the last picture you can see from what places derives the wood. Most of our wood has been air dried for 1-2 years before be finished dried in a kiln. A combination of air drying and kiln drying wood is ideal! Trying to expedite this process makes if much more likely that the wood will bowing, twisting and cracking. FINISHING: Every single one of our live edge and other wood furnishings goes through a labor-intensive, one to two weeks finishing and curing process. We only use all-natural, a mixture of oils and waxes. For finishing we used one of the best products on the market today. German products - Osmo, which are present almost worldwide. They are highly resistant to stains such as human sweat, red wine, cleaners,... It is waterproof, it is not sensitive to pressure, no cracks, peeling or withdrawal. It is easy for maintenance - every 3-5 years only re-applied in a thin layer with a cotton swab, that takes you no more than half an hour. WHEN YOU ORDER: - We sent you pictures of selected wood that will be used for your product - Every few days we informed you about the progress of work with pictures GOOD TO KNOW: - All of our products are carefully packed in a 1 cm thick plywood surrounded by foams and other accessories for packaging - We shipped with TNT and all shipments have insurance ( you don t need to worry if something accidentally damage ) - transit time of shipments is about 5-15 days ( depending on the delivery address ) - transit time is increased only if the shipment go through customs. This is a process in which no one can influence and it happens once in a while NOTE: The item pictured is an example, and yours will be made to order. Your order will be a unique work of art, made to your specifications. Appreciate that the colour and grain will vary from piece to piece. Please allow us 1-2 weeks for the creation of this piece. At the request we can send you pictures of selected wood for your product that you tell us if you agree. Each product is specially designed templates from natural leaf. Thus, every product is unique. For the three tea lihgts. It is a beautiful decoration in your home, office, shop, bar, ... WOOD: Comes from the Slovenian Julian Alps, which are part of the European Alps European Alps are the highest and most extensive mountain range system that lies entirely in Europe, stretching approximately 1,200 kilometres (750 mi) across eight Alpine countries: Austria, France, Germany, Italy, Liechtenstein, Monaco, SLOVENIA, and Switzerland, This is a high quality wood and we also have a large selection of different types of wood. On the last picture you can see from what places derives the wood. Most of our wood has been air dried for 1-2 years before be finished dried in a kiln. A combination of air drying and kiln drying wood is ideal! Trying to expedite this process makes if much more likely that the wood will bowing, twisting and cracking. FINISHING: Every single one of our live edge and other wood furnishings goes through a labor-intensive, one to two weeks finishing and curing process. We only use all-natural, a mixture of oils and waxes. For finishing we used one of the best products on the market today. German products - Osmo, which are present almost worldwide. They are highly resistant to stains such as human sweat, red wine, cleaners,... It is waterproof, it is not sensitive to pressure, no cracks, peeling or withdrawal. It is easy for maintenance - every 3-5 years only re-applied in a thin layer with a cotton swab, that takes you no more than half an hour. Each Leaf is unique! f you need more than one contact us for discount. Wed love to chat more! NOTE: The item pictured is an example, and yours will be made to order. Your order will be a unique work of art, made to your specifications. Appreciate that the colour and grain will vary from piece to piece. Please allow us 1-2 weeks for the creation of this piece. 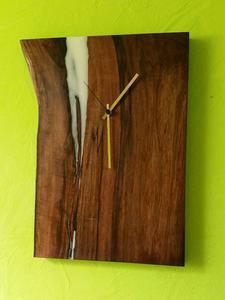 This modern/rustic wall clock is made of wood walnut or pear with a natural edge. 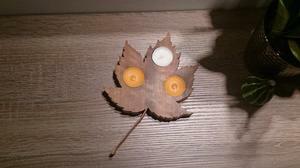 Irregularities in the wood are watered with a glow in the dark resin. WOOD: Comes from the Slovenian Julian Alps, which are part of the European Alps European Alps are the highest and most extensive mountain range system that lies entirely in Europe, stretching approximately 1,200 kilometres (750 mi) across eight Alpine countries: Austria, France, Germany, Italy, Liechtenstein, Monaco, SLOVENIA, and Switzerland, This is a high quality wood and we also have a large selection of different types of wood. On the last picture you can see from what places derives the wood. Most of our wood has been air dried for 1-2 years before be finished dried in a kiln. A combination of air drying and kiln drying wood is ideal! Trying to expedite this process makes if much more likely that the wood will bowing, twisting and cracking. FINISHING: Every single one of our live edge and other wood furnishings goes through a labor-intensive, one to two weeks finishing and curing process. We only use all-natural, a mixture of oils and waxes. For finishing we used one of the best products on the market today. German products - Osmo, which are present almost worldwide. They are highly resistant to stains such as human sweat, red wine, cleaners,... It is waterproof, it is not sensitive to pressure, no cracks, peeling or withdrawal. It is easy for maintenance - every 3-5 years only re-applied in a thin layer with a cotton swab, that takes you no more than half an hour. WHEN YOU ORDER: - We sent you pictures of selected wood that will be used for your product - Every few days we informed you about the progress of work with pictures GOOD TO KNOW: - All of our products are carefully packed in a 1 cm thick plywood surrounded by foams and other accessories for packaging - We shipped with TNT and all shipments have insurance ( you don t need to worry if something accidentally damage ) - transit time of shipments is about 5-15 days ( depending on the delivery address ) - transit time is increased only if the shipment go through customs. This is a process in which no one can influence and it happens once in a while It includes a set of material for attaching on to the wall. This modern wall clok can turn as you want. If you need a custom dimension contact us. Each wall clock is unique! NOTE: The item pictured is an example, and yours will be made to order. Your order will be a unique work of art, made to your specifications. Appreciate that the colour and grain will vary from piece to piece. Please allow us 3-4 weeks for the creation of this piece. At the request we can send you pictures of selected wood for your product that you tell us if you agree. 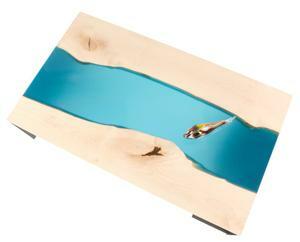 Modern coffee table is made from two pieces of carefully selected wood with live edge holding together by resin. This coffe table is suitable for your living room, office, showrooms, reception lounges, salons, cafés, bars, ... WOOD: Comes from the Slovenian Julian Alps, which are part of the European Alps European Alps are the highest and most extensive mountain range system that lies entirely in Europe, stretching approximately 1,200 kilometres (750 mi) across eight Alpine countries: Austria, France, Germany, Italy, Liechtenstein, Monaco, SLOVENIA, and Switzerland, This is a high quality wood and we also have a large selection of different types of wood. On the last picture you can see from what places derives the wood. Most of our wood has been air dried for 1-2 years before be finished dried in a kiln. A combination of air drying and kiln drying wood is ideal! Trying to expedite this process makes if much more likely that the wood will bowing, twisting and cracking. RESIN: We use a UV-resistant and crystal clear resin! FINISHING: Every single one of our live edge and other wood furnishings goes through a labor-intensive, one to two weeks finishing and curing process. We only use all-natural, a mixture of oils and waxes. For finishing we used one of the best products on the market today. German products - Osmo, which are present almost worldwide. They are highly resistant to stains such as human sweat, red wine, cleaners,... It is waterproof, it is not sensitive to pressure, no cracks, peeling or withdrawal. It is easy for maintenance - every 3-5 years only re-applied in a thin layer with a cotton swab. WHEN YOU ORDER: - We sent you pictures of selected wood that will be used for your product - Every few days we informed you about the progress of work with pictures GOOD TO KNOW: - All of our products are carefully packed in a 1 cm thick plywood surrounded by foams and other accessories for packaging - We shipped with TNT and all shipments have insurance ( you don t need to worry if something accidentally damage ) - transit time of shipments is about 5-15 days ( depending on the delivery address ) - transit time is increased only if the shipment go through customs. This is a process in which no one can influence and it happens once in a while Contact between the resin and wood is very strong! Metal legs are powder coated ( you can choose from many colors ) Each table is unique! If you want a custom dimension or a different design of legs contact us or request custom order. If you need more than one contact us for discount. Wed love to chat more! NOTE: The item pictured is an example, and yours will be made to order. Your order will be a unique work of art, made to your specifications. Appreciate that the colour and grain will vary from piece to piece. Please allow us 3-4 weeks for the creation of this piece. At the request we can send you pictures of selected wood for your product that you tell us if you agree. 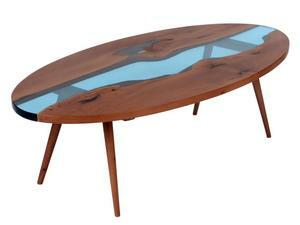 This Vintage - Modern coffee table is made from two pieces of carefully selected wood with live edge holding together by resin. This vintage coffe table is suitable for your living room, office, showrooms, reception lounges, salons, cafés, bars, ... WOOD: Comes from the Slovenian Julian Alps, which are part of the European Alps European Alps are the highest and most extensive mountain range system that lies entirely in Europe, stretching approximately 1,200 kilometres (750 mi) across eight Alpine countries: Austria, France, Germany, Italy, Liechtenstein, Monaco, SLOVENIA, and Switzerland, This is a high quality wood and we also have a large selection of different types of wood. On the last picture you can see from what places derives the wood. Most of our wood has been air dried for 1-2 years before be finished dried in a kiln. A combination of air drying and kiln drying wood is ideal! Trying to expedite this process makes if much more likely that the wood will bowing, twisting and cracking. RESIN: We use a UV-resistant and crystal clear resin! FINISHING: Every single one of our live edge and other wood furnishings goes through a labor-intensive, one to two weeks finishing and curing process. We only use all-natural, a mixture of oils and waxes. For finishing we used one of the best products on the market today. German products - Osmo, which are present almost worldwide. They are highly resistant to stains such as human sweat, red wine, cleaners,... It is waterproof, it is not sensitive to pressure, no cracks, peeling or withdrawal. It is easy for maintenance - every 3-5 years only re-applied in a thin layer with a cotton swab. WHEN YOU ORDER: - We sent you pictures of selected wood that will be used for your product - Every few days we informed you about the progress of work with pictures GOOD TO KNOW: - All of our products are carefully packed in a 1 cm thick plywood surrounded by foams and other accessories for packaging - We shipped with TNT and all shipments have insurance ( you don t need to worry if something accidentally damage ) - transit time of shipments is about 5-15 days ( depending on the delivery address ) - transit time is increased only if the shipment go through customs. This is a process in which no one can influence and it happens once in a while Contact between the resin and wood is very strong! Each vintage coffee table is unique! If you want a custom dimension or a different design of legs contact us or request custom order. If you need more than one contact us for discount. Wed love to chat more! NOTE: The item pictured is an example, and yours will be made to order. Your order will be a unique work of art, made to your specifications. Appreciate that the colour and grain will vary from piece to piece. Please allow us 3-4 weeks for the creation of this piece. At the request we can send you pictures of selected wood for your product that you tell us if you agree. 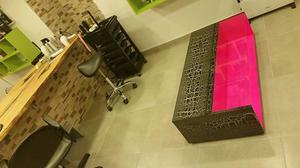 This coffee table is designed so that you alone add decoration. When get one decoration tired of you simply change it. This coffee table may be added almost anything you want from stones. moss, flowers, sand, pebbles,... A coffee table has in the middle a stainless steel container into which you could plant the flowers. This luxury coffee table is suitable for your living room, office, showrooms, reception lounges, salons, cafés, bars, ... WOOD: Comes from the Slovenian Julian Alps, which are part of the European Alps European Alps are the highest and most extensive mountain range system that lies entirely in Europe, stretching approximately 1,200 kilometres (750 mi) across eight Alpine countries: Austria, France, Germany, Italy, Liechtenstein, Monaco, SLOVENIA, and Switzerland, This is a high quality wood and we also have a large selection of different types of wood. On the last picture you can see from what places derives the wood. Most of our wood has been air dried for 1-2 years before be finished dried in a kiln. A combination of air drying and kiln drying wood is ideal! Trying to expedite this process makes if much more likely that the wood will bowing, twisting and cracking. FINISHING: Every single one of our live edge and other wood furnishings goes through a labor-intensive, one to two weeks finishing and curing process. We only use all-natural, a mixture of oils and waxes. For finishing we used one of the best products on the market today. German products - Osmo, which are present almost worldwide. They are highly resistant to stains such as human sweat, red wine, cleaners,... It is waterproof, it is not sensitive to pressure, no cracks, peeling or withdrawal. It is easy for maintenance - every 3-5 years only re-applied in a thin layer with a cotton swab, that takes you no more than half an hour. WHEN YOU ORDER: - We sent you pictures of selected wood that will be used for your product - Every few days we informed you about the progress of work with pictures GOOD TO KNOW: - All of our products are carefully packed in a 1 cm thick plywood surrounded by foams and other accessories for packaging - We shipped with TNT and all shipments have insurance ( you don t need to worry if something accidentally damage ) - transit time of shipments is about 5-15 days ( depending on the delivery address ) - transit time is increased only if the shipment go through customs. This is a process in which no one can influence and it happens once in a while Each coffee table is unique! If you want a custom dimension or a different design of legs contact us or request custom order. If you need more than one contact us for discount. Wed love to chat more! NOTE: The item pictured is an example, and yours will be made to order. Your order will be a unique work of art, made to your specifications. Appreciate that the colour and grain will vary from piece to piece. Please allow us 3-4 weeks for the creation of this piece. 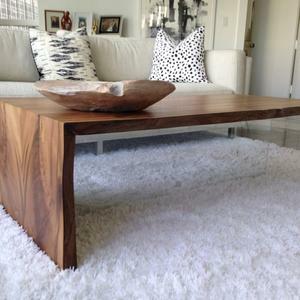 This modern coffee table is made with ash wood and 8mm thick tempered glass. Outside of this coffee table is made with cracked paint and with half matt lacquered. Inside it is painted with the color whic can customer request. You can also choose between these colors: ( we just need RAL number ) http://www.ralcolor.com/ This luxury modern coffee table is suitable for your living room, office, yacht, showrooms, reception lounges, salons, cafés, bars, ... WOOD: Comes from the Slovenian Julian Alps, which are part of the European Alps European Alps are the highest and most extensive mountain range system that lies entirely in Europe, stretching approximately 1,200 kilometres (750 mi) across eight Alpine countries: Austria, France, Germany, Italy, Liechtenstein, Monaco, SLOVENIA, and Switzerland, This is a high quality wood and we also have a large selection of different types of wood. Most of our wood has been air dried for 1-2 years before be finished dried in a kiln. A combination of air drying and kiln drying wood is ideal! Trying to expedite this process makes if much more likely that the wood will bowing, twisting and cracking. WHEN YOU ORDER: - Every few days we informed you about the progress of work with pictures GOOD TO KNOW: - All of our products are carefully packed in a 1 cm thick plywood surrounded by foams and other accessories for packaging - We shipped with TNT and all shipments have insurance ( you don t need to worry if something accidentally damage ) - transit time of shipments is about 5-15 days ( depending on the delivery address ) - transit time is increased only if the shipment go through customs. This is a process in which no one can influence and it happens once in a while Each table is unique! On every coffee table, the pattern of cracked color is different, and because of this, each table is unique If you want a custom dimension or a different design of legs contact us or request custom order. NOTE: The item pictured is an example, and yours will be made to order. Your order will be a unique work of art, made to your specifications. Appreciate that the colour and grain will vary from piece to piece. Please allow us 3-4 weeks for the creation of this piece. 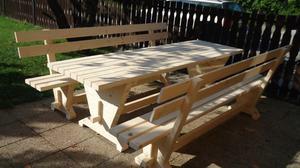 At the request we can send you pictures of selected wood for your product that you tell us if you agree. 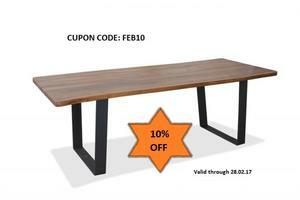 This rustic coffee table is made of carefully selected wood and tempered glass. This luxury wood table is suitable for your living room, office, yacht, showrooms, reception lounges, salons, cafés, bars, ... WOOD: Comes from the Slovenian Julian Alps, which are part of the European Alps European Alps are the highest and most extensive mountain range system that lies entirely in Europe, stretching approximately 1,200 kilometres (750 mi) across eight Alpine countries: Austria, France, Germany, Italy, Liechtenstein, Monaco, SLOVENIA, and Switzerland, This is a high quality wood and we also have a large selection of different types of wood. Most of our wood has been air dried for 1-2 years before be finished dried in a kiln. A combination of air drying and kiln drying wood is ideal! Trying to expedite this process makes if much more likely that the wood will bowing, twisting and cracking. FINISHING: Every single one of our live edge and other wood furnishings goes through a labor-intensive, one to two weeks finishing and curing process. We only use all-natural, a mixture of oils and waxes. For finishing we used one of the best products on the market today. German products - Osmo, which are present almost worldwide. They are highly resistant to stains such as human sweat, red wine, cleaners,... It is waterproof, it is not sensitive to pressure, no cracks, peeling or withdrawal. It is easy for maintenance - every 3-5 years only re-applied in a thin layer with a cotton swab, that takes you no more than half an hour. WHEN YOU ORDER: - We sent you pictures of selected wood that will be used for your product - Every few days we informed you about the progress of work with pictures GOOD TO KNOW: - All of our products are carefully packed in a 1 cm thick plywood surrounded by foams and other accessories for packaging - We shipped with TNT and all shipments have insurance ( you don t need to worry if something accidentally damage ) - transit time of shipments is about 5-15 days ( depending on the delivery address ) - transit time is increased only if the shipment go through customs. This is a process in which no one can influence and it happens once in a while Each table is unique! If you want a custom dimension or a different design of legs contact us or request custom order. NOTE: The item pictured is an example, and yours will be made to order. Your order will be a unique work of art, made to your specifications. Appreciate that the colour and grain will vary from piece to piece. Please allow us 3-4 weeks for the creation of this piece. At the request we can send you pictures of selected wood for your product that you tell us if you agree. 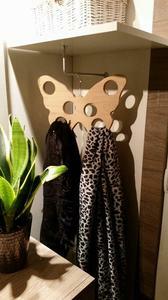 Decorative product which performs the function of the hanger. This wood mirror is made from two pieces of carefully selected wood with live edge. They are not only glued to the mirror, but placed on a frame with this we prevent mirror to cracked when wood moving. WOOD: Comes from the Slovenian Julian Alps, which are part of the European Alps European Alps are the highest and most extensive mountain range system that lies entirely in Europe, stretching approximately 1,200 kilometres (750 mi) across eight Alpine countries: Austria, France, Germany, Italy, Liechtenstein, Monaco, SLOVENIA, and Switzerland, This is a high quality wood and we also have a large selection of different types of wood. Most of our wood has been air dried for 1-2 years before be finished dried in a kiln. A combination of air drying and kiln drying wood is ideal! Trying to expedite this process makes if much more likely that the wood will bowing, twisting and cracking. FINISHING: Every single one of our live edge and other wood furnishings goes through a labor-intensive, one to two weeks finishing and curing process. We only use all-natural, a mixture of oils and waxes. For finishing we used one of the best products on the market today. German products - Osmo, which are present almost worldwide. They are highly resistant to stains such as human sweat, red wine, cleaners,... It is waterproof, it is not sensitive to pressure, no cracks, peeling or withdrawal. It is easy for maintenance - every 3-5 years only re-applied in a thin layer with a cotton swab, that takes you no more than half an hour. WHEN YOU ORDER: -On your request we can sent you pictures of selected wood that will be used for your mirror that you can tell if you like the wood ( It helps us alot if you describe what kind of wood you would like, wood with knots, holes, wood with more straight live edge,.. ) GOOD TO KNOW: - All of our products are carefully packed in a 1 cm thick plywood surrounded by foams and other accessories for packaging - We shipped with TNT and all shipments have insurance ( you don t need to worry if something accidentally damage ) - transit time of shipments is about 5-15 days ( depending on the delivery address ) - transit time is increased only if the shipment go through customs. This is a process in which no one can influence and it happens once in a while It includes a set of material for attaching on to the wall. Wall mirror can turn as you want. If you need a custom dimension contact us. Each mirror is unique! Not suitable for bathrooms! NOTE: The item pictured is an example, and yours will be made to order. Your order will be a unique work of art, made to your specifications. Appreciate that the colour and grain will vary from piece to piece. Please allow us 1-2 weeks for the creation of this piece. At the request we can send you pictures of selected wood for your product that you tell us if you agree.